13 posts categorized "Democratic National Convention"
I'm blogging this evening from a huge press filing center in an obscure corner of the Pepsi Center. There are maybe 100 reporters hunched over laptops and chattering into cellphones as I write. The place actually looks to be a sometimes-basketball court — there are hoops with fiberglass backboards at both ends of this space. 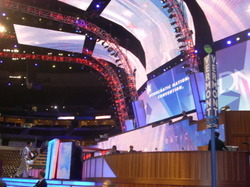 I got onto the convention floor earlier this eve for the first time. It isn't easy — unless you're a mainstream media Big Foot — to obtain one of the green floor passes whose distribution point is treated by the Democratic National Committee as top-secret info. It's chaotic on the floor in a merry sort of way — lots of noise, colors, constant movement in every direction by delegates, pols, press and whoever else has managed to get to the center of the action. The Recreate 68 protest coalition hasn't produced much in the way of crowds or excitement so far. The demonstrators can't get within a quarter-mile of the Pepsi Center so they march through downtown Denver on a regular basis. A typical demo includes only about 200 participants. Meanwhile, the Denver cops ride around in full riot regalia on the running boards of SUVs or they tromp through the streets atop horses that are also wearing shield-type goggles. It's a totally disproportionate show of force and clearly an attempt to intimidate dissidents from exercising their all-American right to free speech. A bunch of 20-something McCainiacs showed up this afternoon at a park where rock bands were serenading an assortment of Obama supporters and others who are well to the left of the Dem prez candidate. I expected a confrontation — at least a shouting match — but nothing developed in the 20 mins. I was there. Denver is an infectiously mellow city, even in its moment at the center of the political universe. 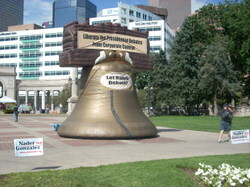 The photo shows an inflatable Liberty Bell displayed in a Denver park. It calls for Ralph Nader to be included in the presidential debates with Barack Obama and John McCain. 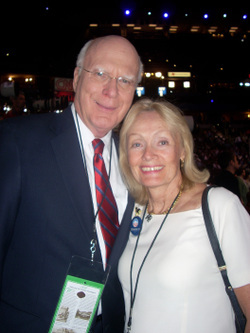 The floor of the Democratic Convention was maybe one-quarter full when Sen Patrick Leahy gave a 10-min speech on Tuesday at 4 p.m., long before prime time. The three rows occupied by the Vermont delegation were filled, however. 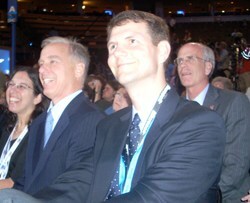 Howard Dean was among the listeners, as was Congressman Peter Welch. Vermont's senior senator (that's him on the right with wife Marcelle) was cheered enthusiastically as he spoke — not about the civil liberties abuses of the Bush years, the theme with which he is most closely identified — but on the topic of Rural America. "I'm Patrick Leahy. I live on a dirt road in a town of 1800 in Vermont. I know rural America." "When Barack Obama is president, we can once again look with hope to a prosperous new day for our rural communities, from the Rocky Mountains of Colorado to the Green Mountains of Vermont." In between, Leahy deplored the impact of high energy prices on rural areas, accused John McCain of being as cozily in bed with Big Oil as has been George Bush, warned of rising crime in the countryside, called for high-speed Internet access throughout the Heartland, and assured his listeners that Obama's policies are superior to McCain's in every way that's relevant to rural America. Think what you will of the Democratic Party's competence and consistency, there's no denying its commitment to — and achievement of — racial diversity. About 45 percent of the delegates in Denver are African-, Latino-, or Asian-American, while those same groups represent about 30 percent of the overall US population. Inside the convention hall, a genuinely rainbow-style celebration is occurring, with a fine funk orchestra providing the soundtrack. Of course the Dems are nominating a bi-racial candidate for president. And they're also highlighting the party's mosaic in the line-up of convention speakers, from the obscure to the superstarry. Chicago Congressman Jesse Jackson Jr. gave one of the most rousing speeches on last night's program, which Michelle Obama headlined and which also included her half-Indonesian sister-in-law. Vermont's delegation isn't nearly as multiracial as, say, California's. But VT Dems have sent a contingent to Denver that's far from monochromatic, as was evident at a breakfast gathering on Monday at the Magnolia Hotel, where the state's 27 delegates and alternates are staying, along with assorted spouses and kids. Kevin Christie, an Obama delegate, is an African-American from White River Junction who's running for a seat in the Vermont House. Having moved from Connecticut in the early 70s, Christie's come to see Vt as "still not having achieved equity throughout the state." 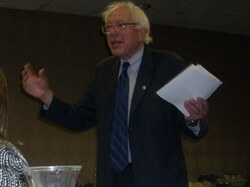 But he adds that Vermont's problems "aren't overpowering to the point where they can't be changed." Christie finds Vermont "open-minded enough to say 'what can we do to change?'" Former Governor Madeleine Kunin, who's here secondarily to promote her book on women and American politics, (she's also blogging for the Huffington Post) points with pride to the gender equity that not only the VT delegation, but all delegations, have established in accordance with party rules. Daria Mondesire, an African-American from Derby Line, says it's important to understand that the candidate she's supporting, Barack Obama, isn't himself African-American. "He's of mixed race," Mondesire points out. "Like my daughter." Mondesire, a writer and clinical social worker, moved from Boston's Dorchester section more years ago than she wishes to specify in order to attend Bennington College. "I've had a mixed experience in Vermont," she says. "But it's been generally positive and I can say Vermont's been good to me." The state's Dems haven't done enough to ensure geographic diversity, Mondesire complains. She says the delegation here consists mostly of Chittenden and Washington county residents, with few members from rural parts of the state. "People from small towns in Vermont don't have much chance," she says. "They don't have the political muscle." Noting that she's the first-ever Democratic delegate from Orleans County, Mondesire says she'll work to improve representation for rural Vermonters. VT's delegates do span the generations. 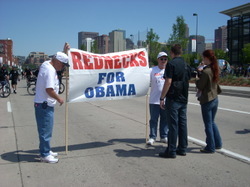 Kunin, 75, is joined in Denver by Taylor Bates, 18 (see photo). He graduated in June from Champlain Valley Union HS and is headed to Tufts next month. Taylor's known here not only for his teen-ness but for having ensured that VT was one of the first three states to qualify as having a "green delegation." Out of his own pocket (he's hoping to fundraise later) Taylor made a $7.50 investment in alt energy for each of the 27 delegation members in order to offset the emissions associated with their travel to and from Denver. Taylor says he appreciates efforts to include previously under-represented groups at the Denver convention, but he suggests that the Obama campaign "is about ending the politics of identity." Taylor isn't interested in being "a token young person here" and wants to focus on ideas rather than on skin shades or gender. He also wants to learn skills in Denver in order to "become a better Democrat, a better organizer." 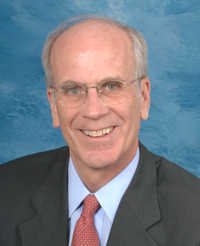 Peter Welch and Bernie Sanders are scheduled to address the VT delegation in the next couple of days. I'll be there when they do and I'll tell you what they said. Here's another photo from Kevin.